Looking for healthy snacks or healthy snack ideas? Japancentre.com’s Japanese rice crackers and snacks section is a great place to start. From low fat snacks to rice snacks to healthy crackers to Japanese rice cakes, japancentre.com has the best selection of rice crackers and Japanese snacks UK-wide. As well as being better for you, Japanese crackers and snacks also come in a great range of flavours, from spicy rice crackers like chilli rice crackers or wasabi crackers, to traditional Japanese treats such as soy sauce flavoured senbei. Continue reading to find out more. Senbei are the most traditional type of Japanese rice cracker. These are circular discs of mochi (rice that has been pounded until it becomes a thick, sticky paste), normally measuring about 5-10cm in diameter, that are baked or grilled over an open fire (which is part of what makes rice crackers healthy). Senbei are often brushed with soy sauce and mirin while cooking to flavour them. Alternatively, they might be wrapped in a piece of nori seaweed, or sprinkled with salt or alternative seasonings like curry, cheese, or ‘salad’. Some might even gain sweeter seasonings, such as matcha green tea and/or or fine wasanbon sugar. 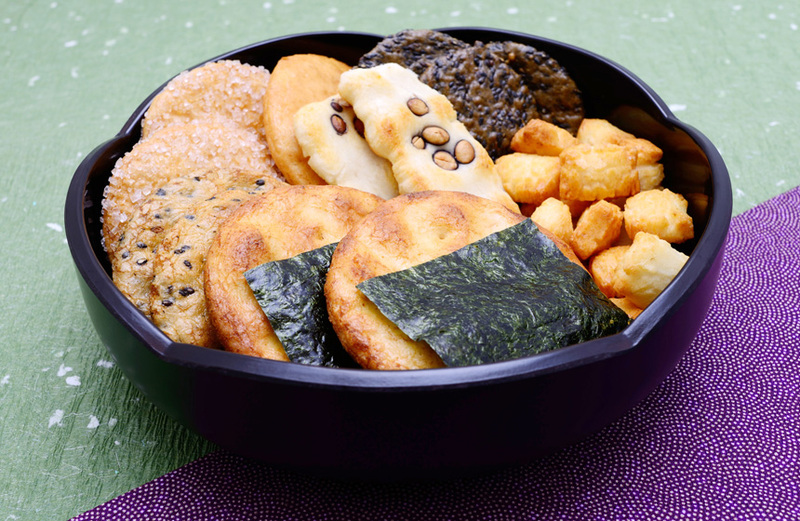 Senbei vary in texture from delicate and crispy to hard and crunchy. Some Japanese snacks like to bring in the heat with spicy seasonings. Other Japanese snacks derive their fire from pungent wasabi. When it comes to shopping for rice crackers, there are so many great flavours and seasonings to choose from, picking just one is practically impossible (especially if you love trying lots of different flavours at once). Fortunately there is a huge range of Japanese rice cracker and snack mixes and assortments also available, with different shapes, flavours, and textures to try. Take a look at japancentre.com’s Rice Crackers and Snacks section for the best selection of Japanese snacks online UK-wide. Wasabi peas are a best-selling snack at japancentre.com. Curry is used as a flavour in rice crackers and other Japanese snacks.